It's heart warming to see the things I love doing good for the people I love. I was sent a beautiful pink fascinator hand crafted by designer Shilpa Iyengar from her Pink Ribbon Collection to benefit breast cancer research. I decided to pair it with one of my muted tone 1940s dresses so it'll really stand out. This dress was from a private estate and was in serious disrepair when I bought it. Crumpled up, very dirty and some pretty noticable holes. But, you know me, I can't turn down something beautiful that just needs a little love so I brought it home and fixed it up. Now, it's one of my favorites and the color is great so it can be worn with anything, like Shilpa's bright pink fascinator. functional form. I let the concept guide me in whatever I design and hope to produce a wearable work of art in the process. Inspired by my travels across the world and by my love of cultural history, I design clothing, shoes, hats, and textiles in hopes of bringing my vision to the public as painter would a painting." Show your support for young designers and wonderful causes by visiting the Young Designers Collective Shop. 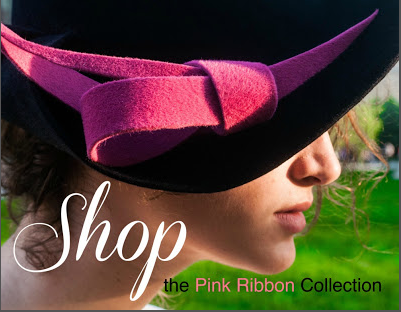 Save 15% off by using code PINK_POST when you shop the Pink Ribbon Collection. The YDC motto is “doing well by doing good” - and they sure did! I love the pink fascinator, and the fact that it's hand crafted, just makes it more adorable! So, I've popped to their site and there it was: "The hat is made from recycled angora wool" - key word here "recycled".. in the spirit of "make, do, mend" yet another great thing. Oh, such a cute outfit! I love the modern spin on a fascinator; so classy and adorable! Not to mention, the rest of your outfit is great! You're right; the neutrals are so versatile, and you're rockin' 'em! Super cute hair accessory, and those shoes are so sweet! It is a little off topic, so I am sorry. Sorry to derail a bit there. The facinator is great and it is a good cause. What a gorgeous, endlessly elegant ensemble to help support such an incredibly important cause. You're looking so lovely today! Beautiful!